In her latest exhibition, Shifting Landscapes, Jody Rosen employs a considered use of mixed media and intuitive painting techniques to evoke lush and seemingly endless mountainous landscapes — a tribute to classic Australian bush scenes, inspired by a serendipitous trip to the Blue Mountains. The series’ generous, coloured illustrations evoke the freshness and silence of this iconic landscape, as the spacious horizons materialise from several months of plein-air painting. 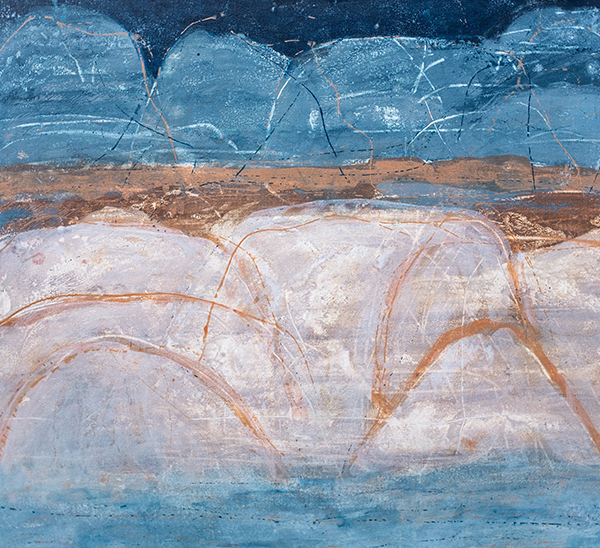 Espousing the complex and overwhelming natural landscape she immersed herself in, Rosen’s expansive yet contemplative use of the cool palette culminates in a series that evokes the unique clarity that comes after a change of season.